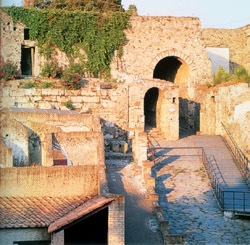 This three hour guided-tour includes, among other things, the visit of Villa of Mysteries and part of the city walls from where you can enjoy a magnificent view of the whole Roman town. Until a few years ago, the origins of Pompeii were enveloped by dense fog. The hypothesis could not be confirmed due to lack of evidence. In recent years, however, archaeologists have been able to begin to study the ancient city walls and have found the foundations of some homes, dating back at least to the sixth century BC . 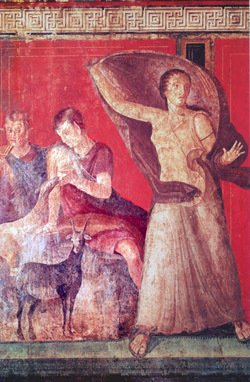 In questo periodo Pompei possiede almeno una prima cinta muraria, il cui perimetro segue grosso modo l'andamento dell'altopiano di origine lavica. 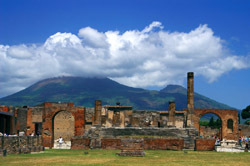 During this period, Pompeii has at least one first wall, whose perimeter roughly followed the plateau of volcanic origin. The presence of the fortifications is an element of great importance, since the construction of city walls always requires a rather advanced degree of development in the political organization of a settlement. 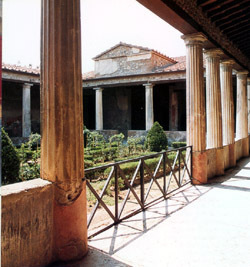 Visit the Pompeii ruins on foot for approximately three hours with a English-speaking local guide on an archaeological journey through the ancient city. 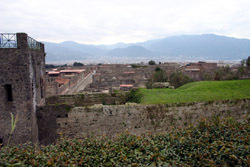 Through the remains and ruins of this ancient city, you can visit also Villa of the Mysteries and take a photo from the top of the city walls of Pompeii.